This riveting and sonorous duet for two basses sees two great forces face-off for who shall have ultimate power. Verdi wrote his five-act grand opera Don Carlos for Paris, where it was first performed in 1867. He later revised the opera for Italy as Don Carlo. He revised it further as a mixture of the French and Italian versions, sung in Italian, and it is this version from 1886 that The Royal Opera performs. One of the opera's most memorable scenes in Don Carlo is the confrontation between King Philip II of Spain and the Grand Inquisitor, ‘Son io dinanzi al Re?’ (Am I before the King?). It is a fine example of one of the distinctive features of 19th-century French grand opera: individuals caught up in the great sweep of history, subject to powerful forces beyond their control. In this scene, two particularly powerful forces confront each other: the state as embodied by King Philip; the Catholic Church by the Grand Inquisitor. Will the Church give way to the State, or must the State back down in the face of the Church? Which force really rules Spain? The scene takes place in the fourth of the opera’s five acts. We have already been shown the competing elements that spark the drama between these two powerful men. We know that Philip II has married Elizabeth of Valois to seal a political alliance. But Philip’s son – Don Carlo of the title – and Elizabeth are in love. Don Carlo’s friend Posa urges the prince to challenge his father politically – while Philip thinks that Posa is a faithful adviser to the throne. By the time of this duet, we’ve seen that the story is fraught with personal conflicts and political power games, with Philip II caught in the middle of it all. Enter the Grand Inquisitor, who will demand not only that Philip execute his son, but that he also deliver up Posa to the hands of the Inquisition. 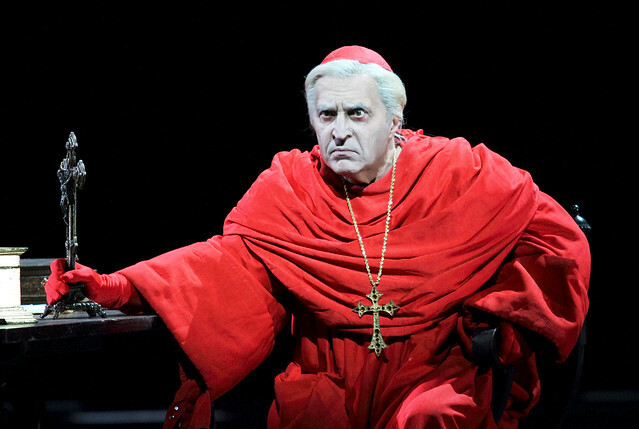 The Grand Inquisitor makes few appearances in the opera – although his music pervades throughout. In this highly charged duet, there is no sustained melody, rather a set of questions and answers, sometimes direct statements, each shifting musical direction to generate a constant air of unease: what is going to happen next? Both characters are sung by bass voices, and the instrumentation is often low and sonorous. So there is a weight and darkness in the music to match the mood, as the Inquisitor threatens the King under the pretence of it being God’s will. When the meeting is concluded, Philip has his answer: Posa will have to be sacrificed. A musical phrase for Philip heads right to the top of his vocal range and then plunges down a whole two octaves to the vocal depths to mark the chilling result: ‘Dunque il trono piegar dovrà sempre all’altare!’ (Then the throne will always have to give way to the altar!). Another duet from earlier in Don Carlo gives an idea of the extraordinary dramatic range Verdi explores in this opera. Midway through Act II there is Don Carlo and Posa’s ‘Dio che nell’almo infonde’: an expression of enthusiastic brotherhood in the cause of justice. Instead of musical unpredictability to match a conversation of challenge, here there is a clear melody based on martial rhythms and fanfare-like phrases. Don Carlo and Posa both think the same so they both sing together; musically their vocal lines run in parallel. The words are honest and direct, no subtle subtexts worrying away in the words or in the music. This is popular hit of sorts, both heart-on-sleeve and rousing. So despite the fact that the two duets share significant features – both with male voices, both scenes that are vital to the story, and both memorable highlights of the whole opera – in purpose and in musical approach they could not be more different. Don Carlo runs 12–29 May 2017. Tickets are still available. The production is a co-production with Norwegian National Opera and the Metropolitan Opera, New York, is sponsored by Coutts and is staged with generous philanthropic support fromvAud Jebsen, The Taylor Family Foundation, Simon and Virginia Robertson, the Patrons of Covent Garden and The Royal Opera House Endowment Fund. The scene in the king's study starting with Phillip's reverie, through the confrontation with the Grand Inquisitor, Elisabeth's demand for justice, Eboli's confession and finally the princess's resolution to save Carlo contains a whole opera's worth of superb music and drama. I must confess that I'm not a great fan of the Carlo/Posa duet but I do love the way that it echoes through their relationship from that first optimistic rendition, then the strain brought about by the Eboli confrontation, that haunting echo after Posa disarms Carlo and the final meeting in the prison cell. Historically, the Spanish Inq was an organ of state: when the King said jump, it said how high. It furnished the Mazzini-Garibaldi age (and Schiller's romantic age) with a handy cardboard villain, and Verdi's music for their big scene is beyond awesome, but the whole opera (possibly my favorite Verdi) is nonsense as history. Fwiw even in Verdi's script the GI does not demand Carlo's execution: he ratifies Philip's request for a moral stamp of approval for it. And - erm, the thing where Paata Burchuladze is made up to look like Bendict XVI. Is that what passes for telling or profound in British opera today?